Joan creates artisan jewelry. Her genre is beaded, wire, wire-wraps, even crochet wire pieces. She includes everything from necklaces, bracelets, rings, and earrings. Each artisan piece is not art, but unique as well. 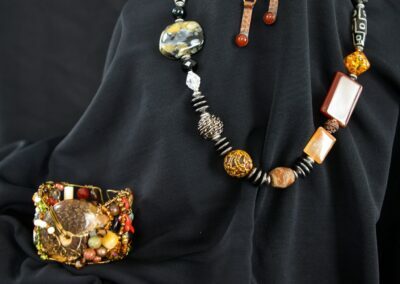 The wearer is assured of that one-of- a- kind artisan jewelry that becomes a signature piece in the purchaser’s wardrobe. Joan has several venues for sales. She participates in festivals (including Art in the Garden presented by the DCAC Bowen Center for the Arts). She also arranges home shows, conducts workshops and sells online.